The Taizé Hamina meeting was small but beautiful, and meaningful. The territory in this region has changed hands so many times over the centuries. Though borders are marked, people realise that they are only temporary markers on the ground. Local people & Finns from elsewhere in the country mixed with Europeans from the south, nine pilgrims from Saint Petersburg, Russia, and two refugees from Afghanistan were the core of the meeting. The ’Old Parish House’ meeting-place for youth from the parish was the birth-place of the artist Hugo Simberg (1873-1917). 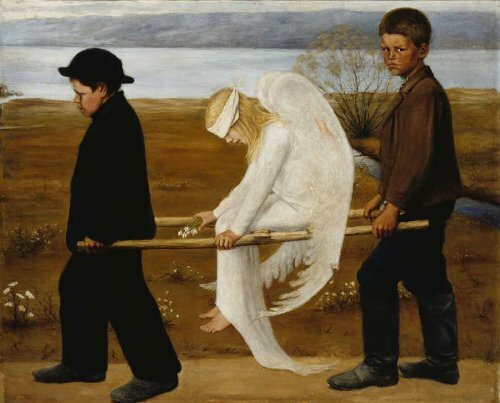 His painting “The Wounded Angel”, was voted Finland’s “national painting” in 2006. Its theme of two healthy boys carrying an injured girl towards the Blind School speaks loudly about Human Solidarity and the struggle for Peace. The girl clutches a bunch of snowdrops, symbolic of healing and rebirth. The first prayer took place on a large concert stage in the old Bastion, it was important that the meeting speak to all in the city and not just church members. After a prayer everyone was greeted by the City manager, Metropolitan Ambrose (Orthodox) and the brother from Taizé taking part in the gathering. The youth of Hamina then shared music, children’s circus, and dancing. On Saturday, after morning prayer, a short Bible introduction was given on what Jesus’s words in John 14:27 might mean for us. On Saturday afternoon there were lots of workshops: Father Ville the Orthodox priest from Hamina, led a seminar on the prayer of Jesus. St. Francis of Assisi and his search for peace was the theme of another workshop. After the last prayer on Saturday evening, those who wished to sing for a long time stayed on in the church. We prayed for the brother who was making his life commitment in Taizé that same evening. At the same time in the courtyard of the church there were several tents, with live music, hot food and an opportunity to talk. On Sunday morning, participants could choose to attend Eucharist/Liturgy in one of the three churches in Hamina, Lutheran Eucharist at St. Mary’s, Orthodox liturgy at St. Peter & Paul’s, Catholic Mass at Saint John’s church. 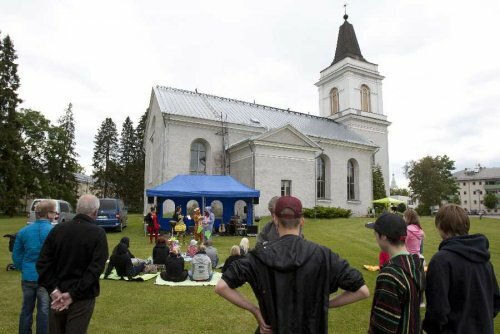 After these celebrations, everybody met near the Town Hall for a Blessing by the church leaders present and a sending out into the world, to share with people back home the peace experienced in Hamina. 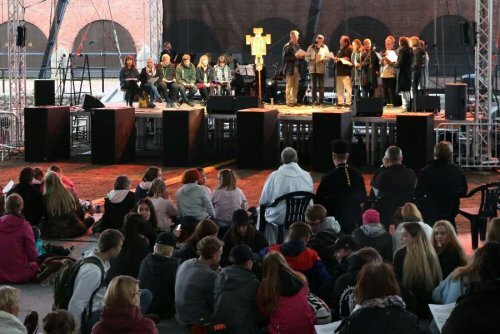 “We hope that the international Taizé meeting will fill the streets of our Circular town with hundreds of young adults from Finland, Russia, Scandinavia, the Baltic countries, and from all over Europe. In these times when tensions and conflicts are growing, for many people on our Earth, peace is something they can only dream about. We want to build a meeting around the theme of “Peace to All” with prayers, silence, discussion groups, and workshops. Events will be held in the historic Bastion and the local churches.